Steve McCutcheon - from Delhi to Beijing! Steve McCutcheon is on a unique journey - from Delhi, India to Beijing, China! Steve is planning to make his Long Ride to raise £100,000 for Action Aid, to improve education to children and communities in the most disadvantaged and deprived areas of India, Pakistan and China. Steve has sent an update to The Guild - and this great photograph! My Chinese and Uighur lessons are coming along well and I can finally report a fully automated website to handle the load of emailed updates via Sat phone. My departure date is now 31st March 2007 and presently I'm stationed in Dunhuang at the end of the Great Wall. I'm actually really stoked to be here as I've always wanted to live in Dunhuang since I first read about it two years ago. The desert around the town is just amazing. The town blends into an incredible surrounding of mountain and sand dune on the edge of the Gobi that also holds a cartload of Silk Road archeological sites. It's also the perfect place to organise transport and preparations for the second half of my journey next Summer as it sits exactly halfway along my route and has big history as a major Silk Road outpost. With great fanfare of trumpets and singing, I’m proud to finally announce, we’ve left! This is a long overdue email update to you now together with some pictures and info that I hope you enjoy from the ride’s preparation period over the last seven months. The year’s been a busy one so far. One where plans have solidified for the journey, a trial ride has been conducted and departure is now imminent this week. I’m also honoured to announce that February was the month that I became a Fellow of the prestigious Royal Geographic Society in London. This was an untold honour made possible by CuChullaine’s nomination. 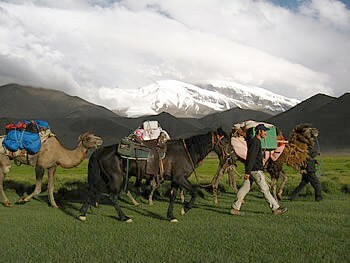 In fact we’ve been underway for a several days now and our route is an extremely exciting one, encompassing an old trade route that connects the villages from the Pamirs all the way through the heart of the Kunlun Shan to Hotan. 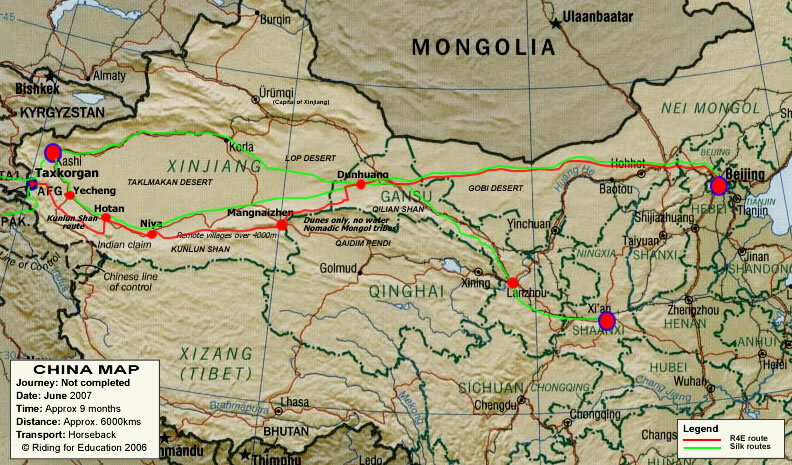 The route averages over 3500m for the first 4 weeks and it will be interesting to view local life away from China’s highway of development and how things have changed since the time of the Silk Road. 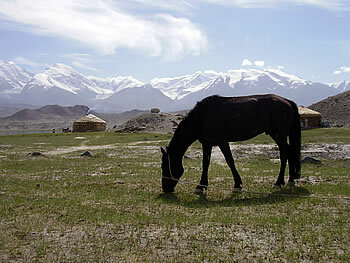 I bought a small dark brown stallion called ‘Boran’, which translates as ‘storm’ in the local Uyghur language. We also sealed the deal in a very interesting way whereby the seller pressed his hand into the dirt at our feet and then into mine, finalizing the transaction in the eternity of earth. The following day, we bought the camels. As you know, huge swathes of the Silk Road across the Gobi have no water and this could extend to several weeks at a time. This is one of the biggest challenges facing the expedition. To counter this, we now have three camels and a camel driver hailing from the desert and who knows how to draw water from the land should the need arise. I must also comment on how well Custom Pack Rigging’s pack saddle performed when attached to a camel. 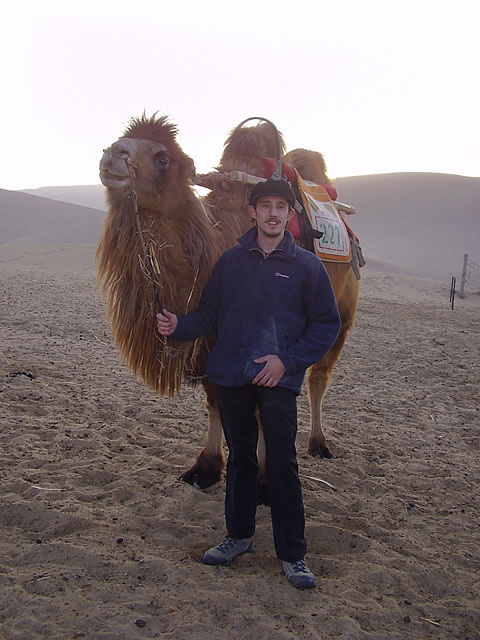 Although Long Rider Tim Cope has already successfully adapted the system, I was still surprised at how easily the pack saddle fit onto the camel once the stiff felt under ‘blanket’ was in place. 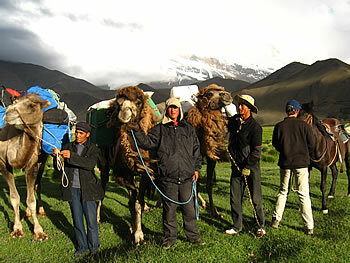 It fit so well, that it’s currently the envy of many of the camel drivers living around Karakul Lake. However, we have had substantial problems with Boran. Boran escaped the first night of our trial journey, spooked by his wet weather blanket going on in the dark. The horse has a nasty history with humans and will allow no one near he doesn’t know. It took me three days to catch him afterwards and whilst his intense distrust of Homo sapiens is a problem there’s something special about this equine I can’t put my finger on. The R4E website is now updated with the story. He is particularly sensitive around his nose and I fear he’s been beaten in the past. Yet, he’s a fearless animal and no situation seems to phase him whether cowboys on motorbikes trying to rope him in or escaping from the confines of a Pamir marsh. He’s like a war charger when provoked and like a stable pony when ridden. He’s the kind of horse that chooses his rider rather than the other way around and despite his misgivings I’m determined to win his friendship. Is he the mount that will carry me to Beijing? With satellite capability, I’ll now be able to do weekly updates from the saddle (typically every Monday) as well as Equipment reviews in a new dedicated section of the Diary – including reviewing the exciting Superfast material from Vettec. The ride now has a page on BBC Manchester. Podcasts and video-casts are now online, the gallery is updated and there’s a brand new school section for schools to join the ride. I’ve also attached several photos, and here is a link to the latest newsletter. British Long Rider Stephen McCutcheon is attempting an historic equestrian journey, a 10,000 kilometre ride from Delhi, India, to Beijing, China! No one has undertaken a journey in this area and of this magnitude since 1905, when the English Long Rider, Major Clarence Dalrymple Bruce, rode from Srinagar, Kashmir, to Peking, a trip of shorter duration. Modern-day equestrian explorer McCutcheon is now trying to make equestrian travel history by blazing a new path from the heart of the Indian sub-continent to the capital of the Chinese people. McCutcheon is already the first person since the Partition of 1947 to have ridden across India and Pakistan together. Having now reached the western deserts of China, the intrepid British Long Rider was attempting to ride through the notorious Pamir mountains when he was nearly killed in a brawling mountain torrent. Having barely survived that danger, McCutcheon's expedition has been stopped, he has been arrested because of a lack of proper paperwork, and this magnificent journey is now in jeopardy. Please read his story, "At the end of the day, Marco Polo needed permits, turns out so do I" in our Stories from the Road section. The Guild received a very short email from Steve in February. I'm still several weeks away from leaving China. Contacts are proving elusive to chase up. Hang in there, Long Rider! I am currently in Taiwan on a continued hiatus from my ride across China. Not only did the Chinese Government refuse permission last year, they also attached a large bill to boot which I am currently saving up for now. Since July 2008 I have been teaching English at a private High School in Taichung (central Taiwan). The kisd are great and there's also a large contingent of foreign teachers here to learn from. However, more and more the open road calls, and I honestly hate being tied to one spot. Practically I have little choice as debts over the past two years and future costs require it - though it doesn't mean I have to like it! Provisionally, I'll finish my journey either in later 2009 or early 2010. I'd like to return to China after the end of my second semester here teaching, to teach in Xinjiang if I can and improve my Uighur. I am already taking Chinese lessons in Taiwan. Click here to read how Steve made horse shoeing history!